Lama Zopa Rinpoche in front of 1,000 Buddha offerings, Kopan Monastery, Nepal, December 2012. Celebrate the Days of Miracles with Friends of FPMT! Are You Making Use of Rinpoche’s Advice? Are You Receiving Information via the CPMT e-Group? 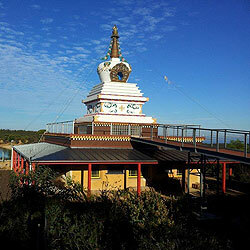 Information on Your Stupas and Prayer Wheels Needed! Rinpoche’s Advice page includes everything you need to know about essential practices to protect from harm, help during sickness and help those who are dying or dead. Also, enjoy Rinpoche’s practice and practical advice, such as how to think while driving; how to be a real professional; how to make ordinary life actions meaningful and the amazing benefits of working for a Dharma center! 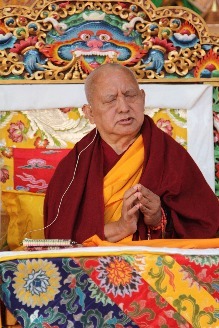 Find the full range of advice from Lama Zopa Rinpoche on Rinpoche’s Advice page. Go to the Lama Yeshe Wisdom Archive for lots more advice from Lama Zopa Rinpoche. In order to provide students with ongoing news about FPMT Education Services including new offerings on the FPMT Online Learning Center or the Foundation Store, we have created an FPMT Education News Blog! You can subscribe via RSS or check back often for new blog postings! This eBook includes the root text of Shalkar Melong, translated with commentary by Lama Zopa Rinpoche, which provides detailed instructions for filling larger holy objects. Also included are the Sung Drub and Rab Na ceremonies for consecrating your holy object. Translated by Lama Zopa Rinpoche, with calligraphy by Jane Seidlitz, The Practice of Virtue is a frameable one-page prayer reminding us of the power of karma and importance of virtue. Offering tormas is an important practice for the accumulation of merit and elimination of obstacles. The Sera Je Food Fund has just sponsored six months’ of nourishment for 2,600 monks studying at Sera Je Monastery in southern India. For 22 years the Sera Je Food Fund has been offering food to the monks of Sera Je Monastery and will continue unceasingly. We would like to offer our sincere gratitude to all of the very kind benefactors who have been contributing to this project over the years and supporting Lama Zopa Rinpoche’s vision. Please read this letter from Sera Je Abbot thanking Lama Zopa Rinpoche, FPMT and all the benefactors of the Sera Je Food Fund. 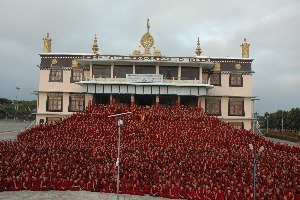 All of the 3,000 monks of Sera Je Monastery are offering nine days of prayers and pujas dedicated to all our kind and generous benefactors. 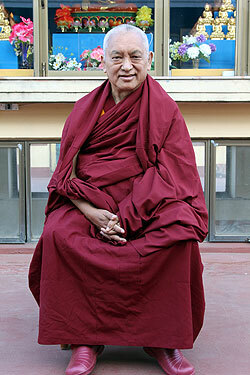 Lama Zopa Rinpoche in Nepal, January 2013. Create merit during these special multiplying days by becoming a Friend of FPMT. As a Friend of FPMT, your financial contribution supports the work of FPMT International Office, which is dedicated to supporting FPMT students, centers, projects and services in fulfilling Lama Yeshe and Lama Zopa Rinpoche’s vision for the Foundation for the Preservation of the Mahayana Tradition. As a benefit of becoming a Friend of FPMT at the Basic level, you receive a subscription to Mandala magazine. Friends at the Patron or Dharma Supporter level receive free access to FPMT’s Online Learning Center in addition to Mandala. If you become a Friend of FPMT during the Days of Miracles, you’ll be sure to receive the next issue of Mandala, which focuses on the practice of pilgrimage and includes advice on this from Lama Zopa Rinpoche as well as personal pilgrimage stories from FPMT students. The FPMT Affiliates Area has some advice from Rinpoche specifically given to those offering service in FPMT centers, projects or services – including advice like this message specifically for directors. This advice is a never-ending source of renewed inspiration, encouragement to those wondering whether to volunteer or not, or wondering how to create merit! There’s also advice from Rinpoche on video! 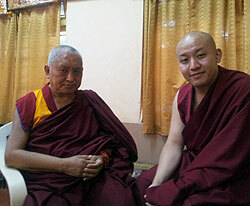 Lama Zopa Rinpoche talking with Zong Rinpoche in South India, December 2012. The CPMT e-group is the essential forum for sharing key organizational information between Rinpoche, International Office, and FPMT centers, projects and services. If you are a director, SPC, board member or registered teacher, subscription to the CPMT e-group will ensure you are up to date! If you think you are not subscribed and need help to do so, please let Center Services know. Reminder! If you have completed or are in the process of completing a stupa or prayer wheel at your center, project or service under the guidance of Lama Zopa Rinpoche, please send Carina Rumrill information on the size, type, location as well as a photo of your holy object. We’ll add your information to exciting new pages being developed on fpmt.org! Did you know that your center can advertise Basic Program retreats via the FPMT website? This page is designed to help students find the retreat they need to fulfill the three-month lam-rim retreat requirement for Basic Program certification. Please contact FPMT Education Services if you have a retreat that should be listed on this page! We would like to remind all our centers, projects and services that the Foundation Store offers wholesale discounts for up to 40% on most education material, 10% to 20% on most meditation supplies, along with generous 60-to-90-day payment terms for FPMT centers. Land of Medicine Buddha, USA is looking for a center manager; Vajrapani Institute, USA needs a relief cook. 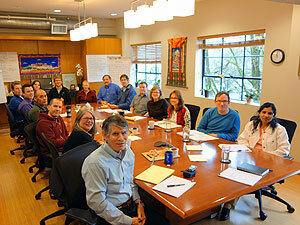 FPMT International Office, Portland, Oregon, USA, February 2013.